Distribution and habitat: Mansoa alliacea is an evergreen climbing plant native to tropical South America, where it grows wild in the tropical rainforests of Brazil, Ecuador, Peru, the Guianas and in Costa Rica. It is especially abundant in the forests near the Amazon, Ucayali and in the Peruvian Amazon. It grows into a semi-woody vine that attaches itself around the trunk of a large tree for support as it climbs skywards to reach for sunlight. The terminal leaflet of this plant is often modified into a tendril that helps the vine to cling onto a support. Description: Mansoa alliacea is an ornamental evergreen vine, 2-2.5m (6 to 8 feet) tall; opposite leaves divided into two ovate leaflets, up to 15cm (6 inch) long. The leaves are bright green. Two special features makes this plant pretty unique: First, the tri-colour blooms. Secondly, its specific garlic-like odor when parts of plants are crushed. Deep lavender flowers with white throat are fading to a paler lavender as they mature. Three different colour of flowers can be seen at the same time on the plant. The vine blooms heavily twice a year: in fall-winter and in spring, although it may also have some flowers on and off throughout the year. Crushed leaves smell like garlic, although of course the plant is not related to the common edible onion or garlic at all. Usually the odor is noticed when its leaves are crushed or when prune its branches. The heavy clusters of flowers do not emit any scent at all, so no worry that the garden or home will heavily smell of garlic when this plant blooms! Mansoa alliacea can be described as either a shrub or a vine because it produces numerous woody vines from the root, that grows only 2-2.5m (6 to 8 feet) tall and form a shrub-like appearance. 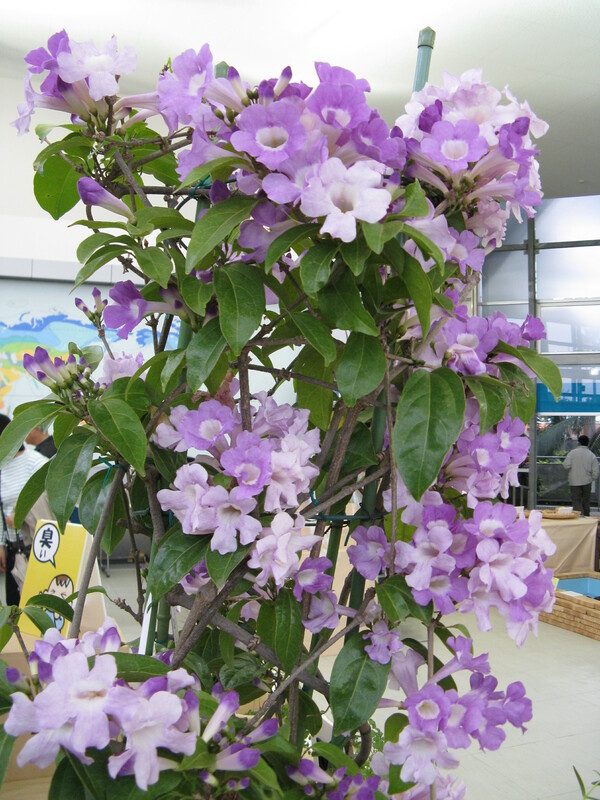 Houseplant care: Mansoa alliacea is a vine with a moderate growth rate. It can be grown in containers and should be trimmed after the flowers are gone. Plants in 12-20cm (5-8 inch) pots should be kept them to about 90cm (35 inch) height; one way to keep them within reasonable limits is to train new growth around an inverted hoop of rattan cane or wire. Outdoors grown Mansoa alliacea should not be overly pruned as flower buds appear on new growth. By pruning away the vines to keep new growth in check, plants will became flowerless. Light: When grown indoors, Mansoa alliacea need bright light and some direct sunlight to flower. Outdoors, plant the Mansoa alliacea in full sun position. Although the plant accept half-shade, but positioning them in a totally shaded location, should be avoided. The lack of sunlight is leading to the development of foliage at the expense of flowering. Temperature: Mansoa alliacea likes warm temperatures in summer and cooler in winter. Normal room temperature is great for Mansoa alliacea all year round. Hardy to temperatures above 1-2º C (34-36°F ), avoid freezing temperatures. Ideally for subtropical regions only, when grown outdoors. Water: During the active growing period water plentifully – enough to keep the potting mixture thoroughly moist, but do not overwater. Requires regular watering, especially during the flowering period. Reduce watering in resting period. Water just enough to make the potting mixture moist, but allow the top centimeter (0.5 inch) or so of the mixture to dry out between waterings. Mist leaves every day for increased humidity. Fertilising: Apply standard liquid fertiliser once every two weeks during the active growth period. Potting and repotting: Mansoa alliacea does well in compost-enriched soil that is well-draining. Move the young plants of Mansoa alliacea into pots one or two size lagers in summer. After they reach the 20-25cm (5-8 inch) pot size, annual top dressing with fresh potting mixture will suffice. Gardening: Mansoa alliacea prefers a sunny to half shady site and can withstand temperatures only above 1-2º C (34-36°F ). It is best to grow it in well-drained soil that is mulched at the base with compost to keep the roots cool and moist. Keep it well-watered so that plants do not shed its lower leaves which can make vines look straggly. The plant is a climbing vine that turns woody and heavy over time. Hence it is recommended to grow it on a strong timber trellis in an exposed area where it can receive direct sunshine for most of the day. Mansoa alliacea is a showy climbing vine for strong supportive structures. Propagation: Mansoa alliacea can be propagate from cuttings. Semi-hardwood cuttings can be taken for propagation. Each stem should have at least 3-4 nodes and can be stuck into a mixture of sand and compost to start the rooting process, after removing some leaves to reduce water loss. Rooting hormone powder is usually not needed. Uses: It said that this houseplant pushes out all the bad luck from the house. It is one of the most rewarding flowering vines, bearing beautiful lavender hued bell shaped flowers. It can be grown in containers and should be trimmed after the flowers are gone. Mansoa alliacea serves a two in one purpose of air purification and treatments (as will be mentioned bellow). Mansoa alliacea is great for chain link fences (or any fence), or a large trellis. It is a vine with a moderate growth rate and one need not worry that is will become an unruly resident in the garden. It can be grown as a loose flowy bush, but is most attractive on supports, fences, trellises, pergolas, etc. It is a vigorous grower and establishes quickly. This plant is even used as substitute for garlic in food. The entire plant – roots, stems and leaves – is used in herbal medicine systems in Peru and Brazil. It is considered analgesic, anti-inflammatory, anti-rheumatic and anti-pyretic. Both the bark and the leaves are used in tinctures and decoctions. In addition, the leaves are also used as a common remedy for coughs, colds, flu and pneumonia and as a purgative. Mansoa alliacea is also effective as a mosquito and snakes repellent.